The Kurt Vonnegut Memorial Library is working to procure some hydrangeas from Vonnegut's house as pictured here, and founder and executive director Julia Whitehead has been extraordinarily encouraging of our project. Thank you, Julia! Many thanks to Hal Poe, Chris Semtner, and The Museum of Edgar Allan Poe in Richmond, Virginia for working with us! We are looking forward to ivy from Poe's mother's grave as well as other plants to be determined, as the house has extensive gardens in honor of Poe. NATHANIEL HAWTHORNE - "Young Goodman Brown" and "The Minister's Black Veil"
The generous folks at The Old Manse in Concord, Massachusetts have already set aside lemon balm from Sophia Hawthorne's kitchen garden. 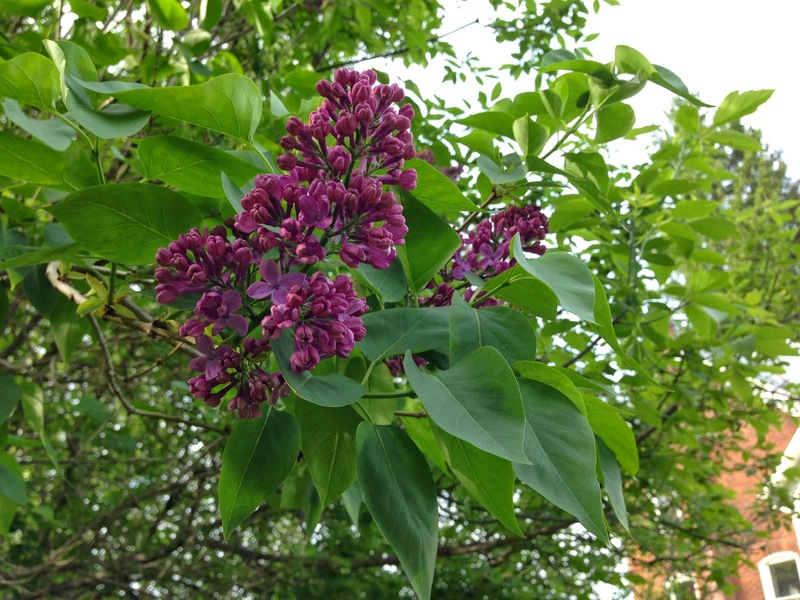 Nathaniel Hawthorne wrote about the lilac bush outside his window in "Buds and Bird-voices" - we will also be receiving a cutting from that bush. 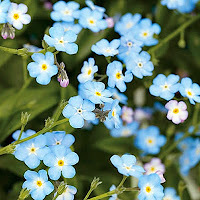 In addition, we hope to receive some of the perennials that surround the house. 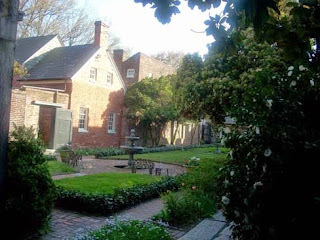 Ralph Waldo Emerson and the Hawthornes both lived there for a time, and Henry David Thoreau planted a vegetable garden there for the newlywed Hawthornes. We have so much work ahead of us! 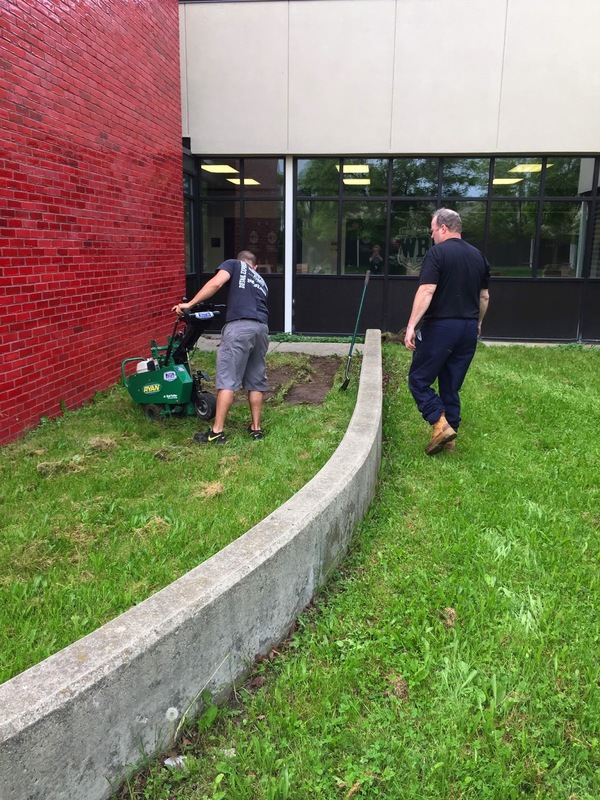 The WBHS Earth Club is working on a compost pile for the sod we tore out, and we have already received offers of donations of both time and money. Thank you all for your support and generosity of spirit! Rolling up turf like sushi rolls! Sod ready for the compost bin (on order from the Earth Club) - we carried all of it by hand! 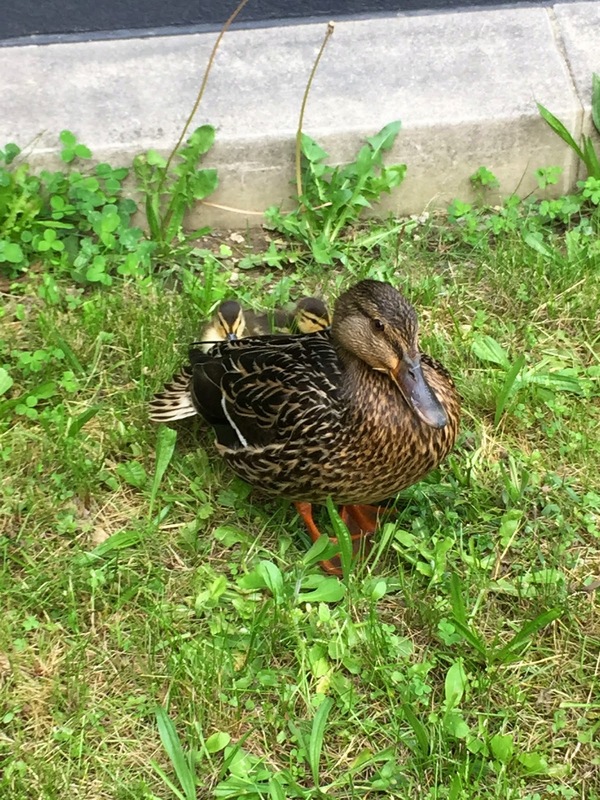 We also had a visit from the resident mama duck and her babies; they hatched in the courtyard this spring and have toddled around to the delight of both students and staff. 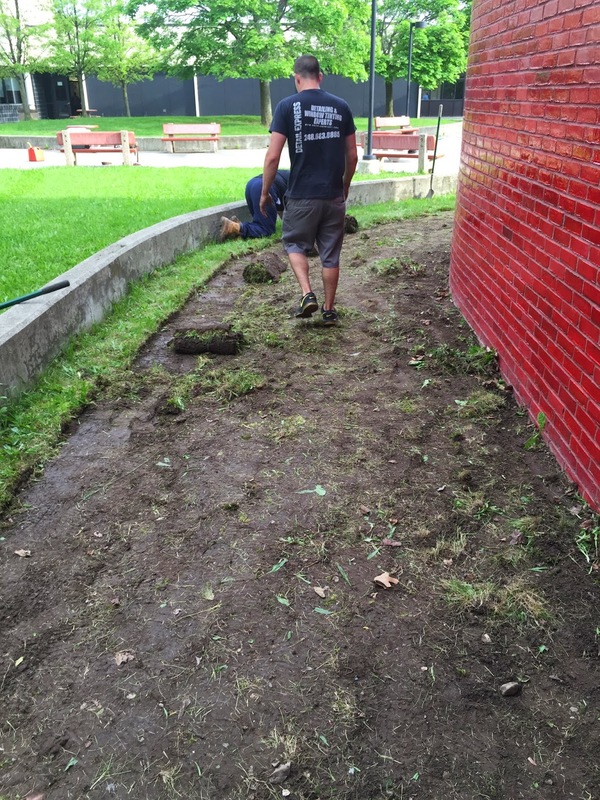 Once we rolled up the sod, we uncovered all kinds of grubs and bugs for the ducklings to chase down and eat. By the end of the night, we were tired, sweaty, and sore, but the ducks feasted like kings! The area is prepped and ready for fill dirt and topsoil. 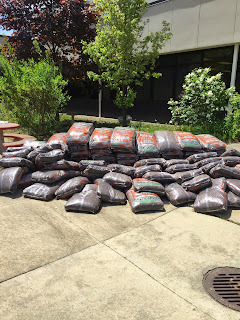 As we have spent our "seed" grant money from the West Bloomfield Educational Foundation, we are actively soliciting donations of money, fill dirt, or topsoil to move into the next phase of our garden. The plants will arrive in the fall, and I'll post again later this week to share some exciting news about additional author partnerships we have forged - I am so excited!!! I also need to thank my dear Uncle Jimmy Peterson. He makes wooden birds for gardens as a hobby, and when I asked him to make a raven for our garden, he got right to work. 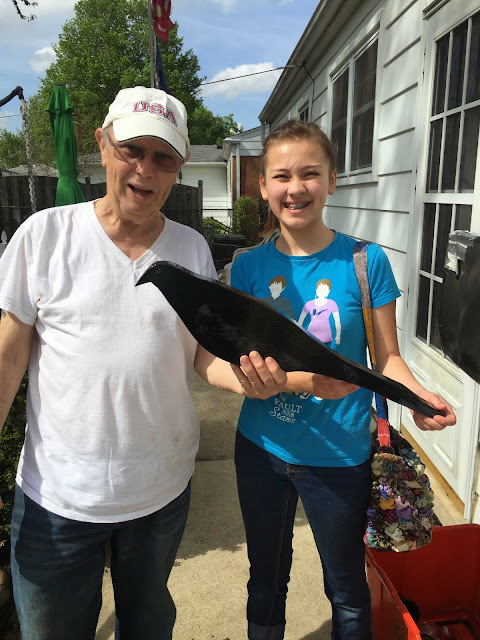 Thanks, Uncle Jimmy! 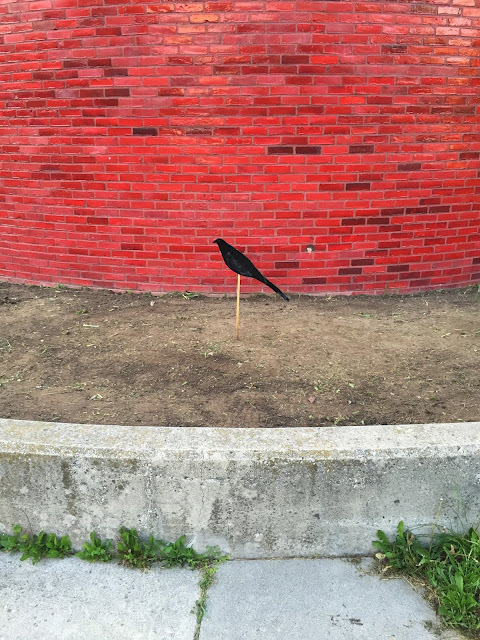 Now the raven stands sentinel over the garden, waiting patiently for the next phase to begin! 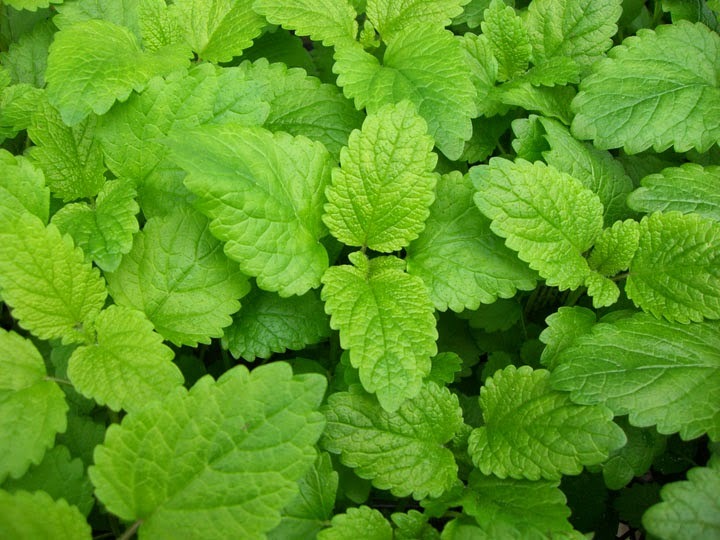 Please contact me here if you would like to contribute in some way to our garden. 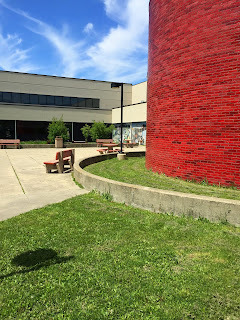 This is the courtyard in the center of West Bloomfield High School. 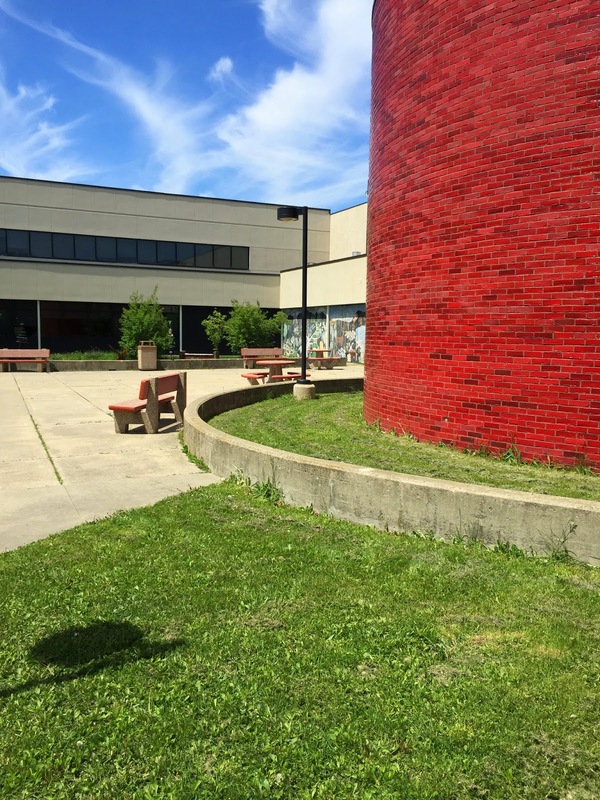 As you can see, the courtyard is desperately in need of an upgrade. 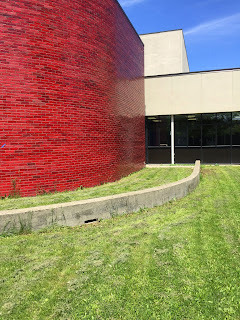 We will begin the garden around the red "pod" classroom and expand as space and funds allow. 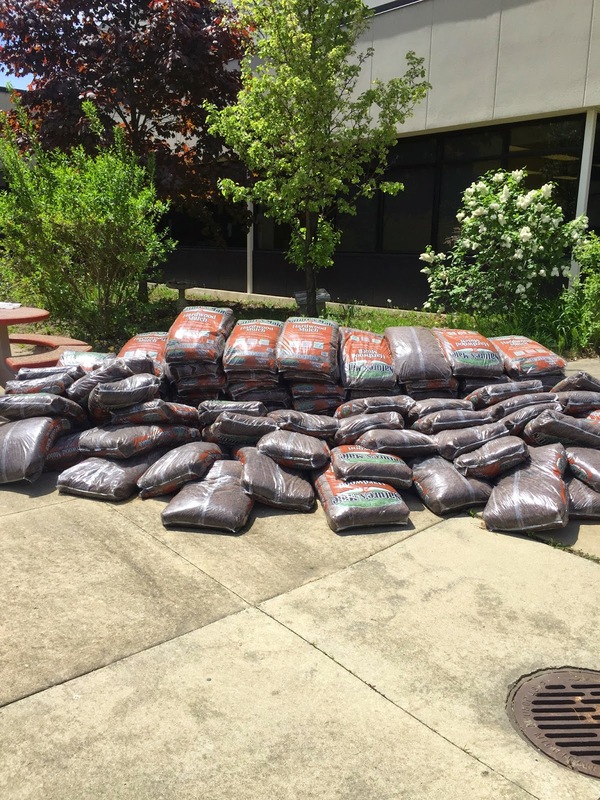 We have already purchased and procured the mulch! Stay tuned for a second author update! 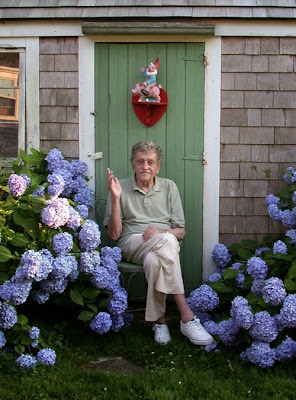 Which Authors Will Be Represented in the Literary Garden? 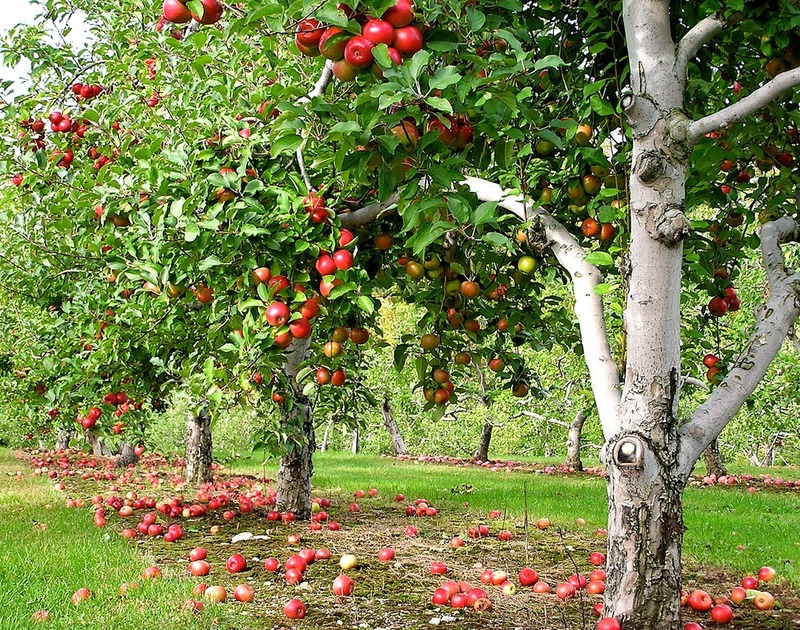 We are working with the Alcott Orchard House to find local varieties of the apple trees Bronson Alcott so prized as the originals have all died out. Please see the Bronson and Louisa May Alcott Orchard House for more information on Bronson Alcott's passion for apple trees. 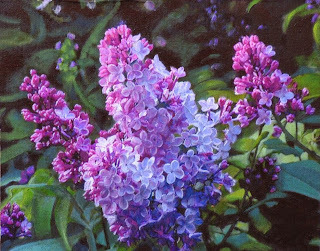 WALT WHITMAN - "When Lilacs Last in the Dooryard Bloom'd"
In honor of Uncle Walt's famous poem, we are hoping to get a cutting of the lilac bush at the Walt Whitman Museum in New York. Many thanks to the Walt Whitman Museum for their assistance in this endeavor! You can read Uncle Walt's poem here. 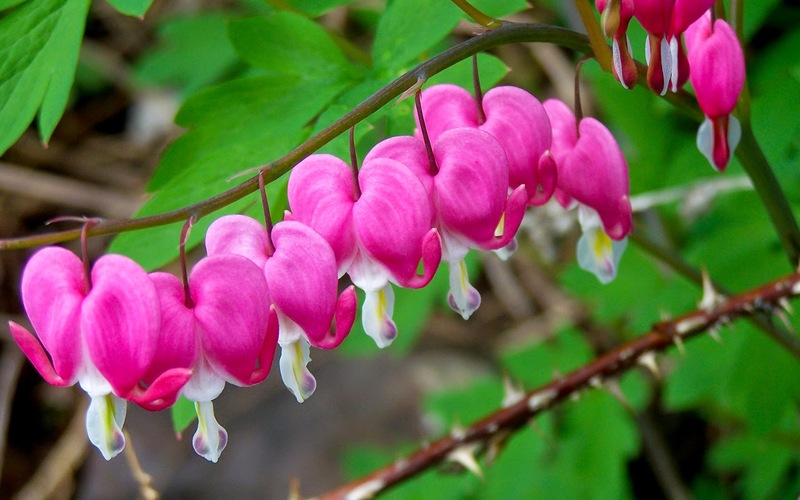 Zane Kesey, Ken's son, reports that Ken found bleeding hearts to be "magical" and also asked that we plant forget-me-nots in his honor. 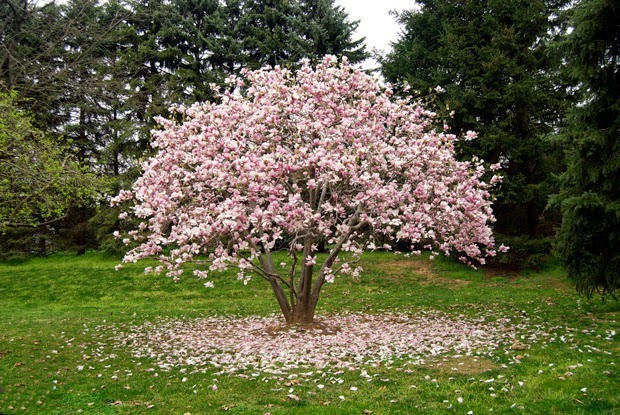 The F. Scott and Zelda Fitzgerald Museum in Alabama is hoping to provide us with magnolia cones in the fall from a tree that was only a sapling when the Fitzgeralds lived there! We are so grateful for their generous offer. NATHANIEL HAWTHORNE - "Buds and Bird-voices," "Young Goodman Brown," "The Minister's Black Veil"
Another update will be posted soon! 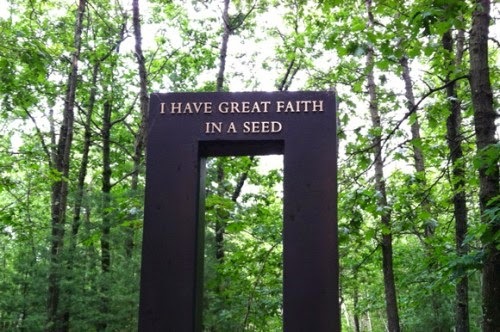 Please contact me here for more information or to contribute to the Walden at West Bloomfield Literary Garden. The courtyard in the center of West Bloomfield High School has been sadly neglected over the years. Overgrown with weeds, featuring uncomfortable tables and benches, the courtyard is in desperate need of some care and attention. We would like to propose the creation of an American literary garden that would feature plants, trees, flowers, and possibly vegetables culled from the gardens of famous American authors and their works. It is possible that with some time and research that we could actually procure some of the seeds or plants from the gardens of these authors that still exist. American authors have long been closely tied to their horticulture. 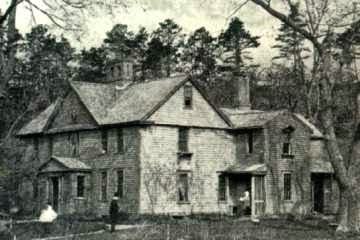 Bronson Alcott, father of Louisa May Alcott (Little Women) and a Transcendentalist and education reformer in his own right, believed apples were the “perfect fruit” and even named one of his homes the “Orchard House” (“Learn About the Alcotts and Orchard House”). 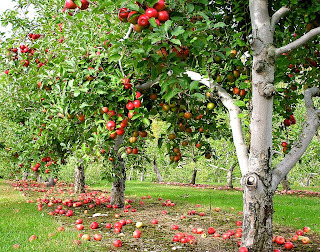 Zora Neale Hurston features a pear tree as a prominent symbol in her most endearing work, Their Eyes Were Watching God. Holland Cotter of The New York Times notes that “Emily Dickinson once called herself a ‘a Lunatic on Bulbs,’ referring to her passion for daffodils, hyacinth and other spring perennials, which she raised indoors in winter in her family home in Amherst, Mass.” It is an exciting prospect indeed to imagine a courtyard featuring the beloved flora of our most inspiring American authors – a place to breathe in fresh air, to learn a little literary history, and to relax among the blooming flowers, trees, and vegetables – and perhaps maybe even read a book? 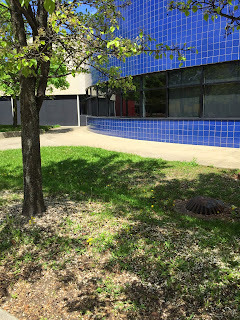 Eventually, we envision plaques with information tying the plants to their literary counterparts as well as upgraded benches and seating areas that would invite students, as Walt Whitman himself notes, to “loafe and invite my soul, / I lean and loafe at my ease observing a spear of summer grass” (“Song of Myself” 4-5). 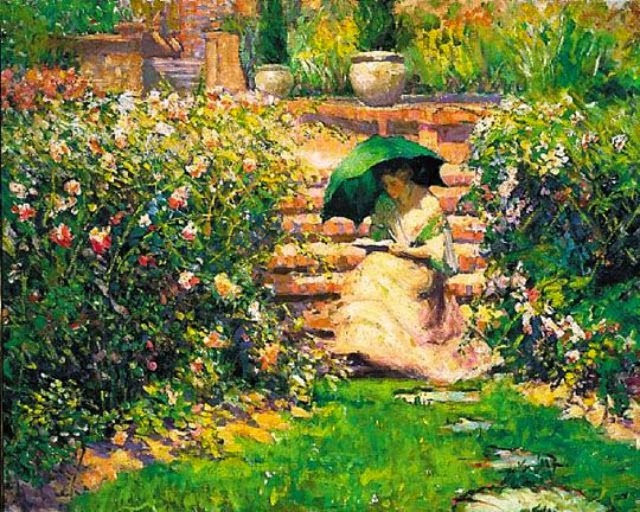 We would also like to bring in the Art Department to create sculptures, busts, and other artistic creations of the authors and books to add to the aesthetic experience of the garden as well as to involve another discipline in the project. • Having a natural view from a classroom makes a difference - it positively impacts both student academic achievement and behavior. Of course, some your students’ outdoor time needs to occur when they are with their families and friends – those are the opportune times for free, unstructured play in natural areas. But, you and your school can also help connect them with nature by providing more outdoor education opportunities, making sure that they continue to have outdoor recess, and even “greening” the school grounds with naturalized areas [emphasis mine]. This project was inspired in part by the Health and Wellness program spearheaded by the WBHS administration. This year, our administration has committed to finding ways to increase unity among staff members and to find a variety of ways to helps us manage the stress of our jobs. Why shouldn’t the students have the same opportunity? Once this garden is created, it will be open to the entire student, staff, and faculty of West Bloomfield High School to enjoy at their leisure. Jennifer McQuillan has been teaching English at West Bloomfield High School since 1999 - passionately, enthusiastically, and often in costume! She has taught everything from 9th grade English to Advanced Placement English Literature and Composition, so she is well-versed in the department curriculum. She has also chaired or co-chaired the department in some form or fashion since 2008. Her favorite books are largely culled from American literature - The Great Gatsby, The Catcher in the Rye, One Flew over the Cuckoo's Nest, and To Kill a Mockingbird - just to name a few. She is a former journalist for WJBK-TV and WWJ-AM, and she was an adjunct professor in English for Oakland Community College from 2008-2012. She is a published author of several academic articles and was a nominee for Oakland County High School High School Teacher of the Year in 2013. Josh Barclay is a twenty-three year veteran of teaching both high school and university physics. 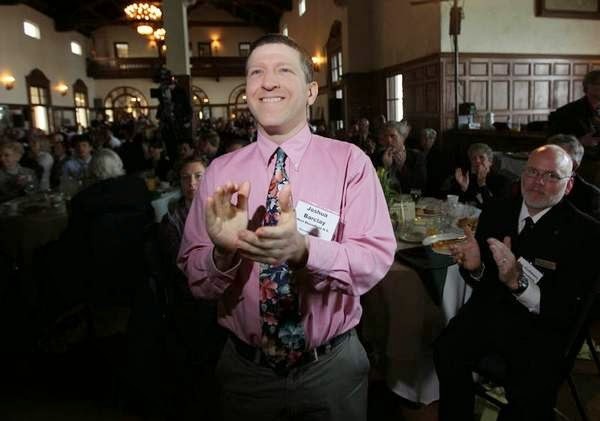 He has taught a wide range of physics courses including calculus-based mechanics and electricity & magnetism labs at Eastern Michigan University, a conceptual physics course for high school juniors which he created for West Bloomfield High School, and even a physics course geared for elementary school teachers at EMU. He employs a multi-sensory approach which has been shown by research to be much more effective than the typical lecture that many students receive in school. 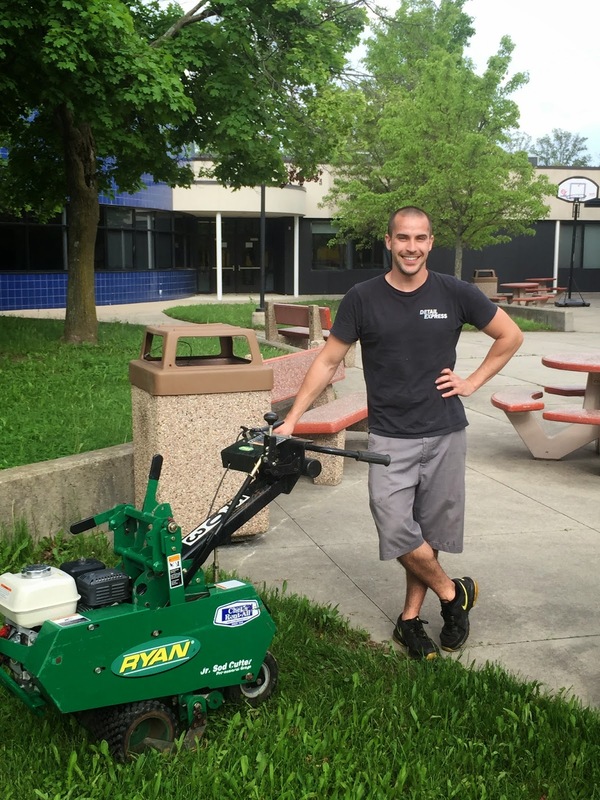 He is also the sponsor of the Earth Club and the force behind the West Bloomfield Initiative for Renewable Energy. The effectiveness of this kind of work cannot be measured by traditional metrics for some time. This is a long-term project that that will take time – years, even - to develop. We will need to create the space first and then see how teachers incorporate the literary garden into their lesson plans and perhaps even their prep periods! Having a quiet place to meditate, to sit with nature, to escape the confines of our mostly windowless building has the potential to increase the happiness and well-being for students, faculty, and staff alike. Only after the garden is established can we hope to tie its existence to student achievement. York Times. 29 April 2010. Web. 7 October 2014. Orchard House. 1997-2014. Web. 7 October 2014. September 2014. Web. 7 October 2014. Foundation. 2014. Web. 7 October 2014.